As Ramadan approaches we need your help to ensure that our impoverished brothers and sisters in Syria have enough food and water to be able to break their fast. It is narrated that the Prophet Muhammad (Peace Be Upon Him) said “whoever gives Iftar to one who is fasting, they will have a reward like it without it being decreased in the slightest bit” [Tirmidhi] Can you imagine receiving the reward for fasting, without even doing so? 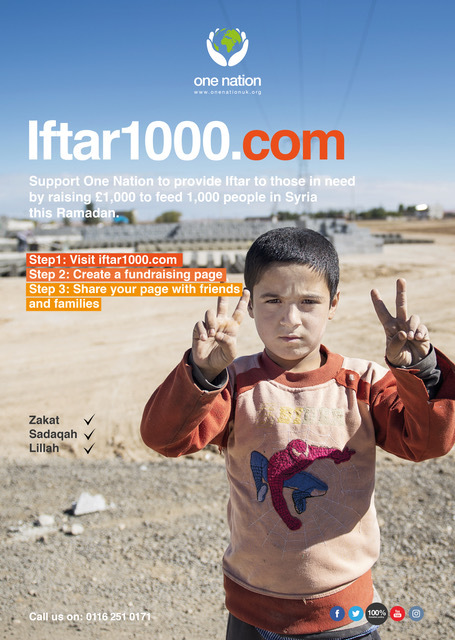 In Syria it costs only £1 to provide an Iftar meal to a person in need. That means for just £1 you could gain the reward of a fasting person. But why stop at just one? With thousands of people in Syria in need right now, the opportunity exists to earn a much greater reward. Through our Iftar1000 campaign, you can help to provide 1,000 iftars this Ramadan and earn the reward of 1,000 fasts. How Do I Help Provide 1,000 Iftars?